The Green Building Council of Australia (GBCA), today recognised Stockland for taking an industry-leading approach to sustainable design and development with the $222 million redevelopment of Stockland Wetherill Park, awarding the project a 5 Star Green Star – Retail Centre Design rating. Stockland is currently undertaking a transformation of the 32-year-old centre, located in Sydney’s thriving Western Suburbs. Upon completion in mid-2016 Stockland Wetherill Park will be a state-of-the-art, sustainable community hub. Launched by the Green Building Council of Australia in 2003, Green Star is Australia’s only national, voluntary, holistic rating system for buildings and communities. The 5 Star Green Star rating by the Green Building Council of Australia signifies ‘Australian Excellence’. Stockland Development Manager, Justin Travlos said, “We are extremely proud that our delivery of Stockland Wetherill Park has achieved Australian excellence for sustainable design and delivery. Stockland Wetherill Park has been recognised for incorporating sustainability into all aspects of the shopping centre redevelopment, across design, management, indoor environment quality, water, materials, transport, emissions, land use and ecology. A number of state-of-the-art sustainability features have been incorporated including mixed-mode air conditioning within the malls, low-energy light fittings and climate and responsive ventilation systems to provide air conditioning to the centre efficiently. “The community initiatives at Stockland Wetherill Park are part of a longer term strategy to provide our customers and the local community with an experience that engages and inspires," Mr Travlos said. A number of new innovations have also been included during the construction phase to ensure all elements of the redevelopment maintained sustainability standards. Most notable has been the delivery of the first high performance construction site office in Australia by construction partner Brookfield Multiplex. Stockland is proud to have the most Green Star rated shopping centres in Australia, this 5 Star rating is the first for the Stockland retail portfolio. 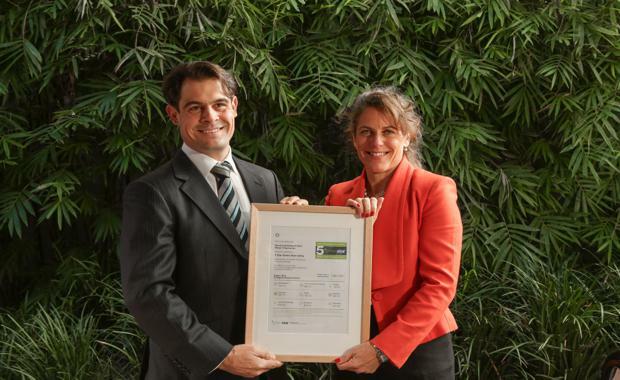 Stockland is also rated as one of the most sustainable property companies in the world and its long term commitment to sustainability has been demonstrated by its listing on the Wold Dow Jones Sustainability Index for the last eight years.